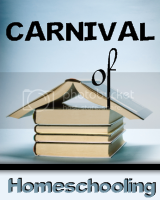 The Carnival of Homeschooling: 42 edition is now up at Home Spun Juggling! This recent issue of the Carnival takes a look at the number 42 and all the interesting ways this number has come into play from being the Ultimate Answer to the Secret of the Universe (Hitchhiker's Guide to the Galaxy)to frowning using about 42 muscles. The Carnival also contains more of Cristina's wonderful and original comics, always worth a visit. Take a moment and go visit the Carnival. It's sure to warm your heart.